Over the past year, I’ve taken on a more “public” profile with my advocacy and activity in local issues. I always say that it’s my friend Cheri’s “fault” because she taught me to become more engaged in the happenings around the city (London, On). Given my tendency toward vocal pursuits, I have undertaken many ventures over the years – advocacy and leadership for Parkinson Society, running a networking group for small businesses, starting my own business, fundraising for many different causes, and promotion of those causes through social media. This past year was no different. But I’ve realized that with more public involvement there is more public communication required. I know I’ve entered into several discussions and contemplated very publicly several advocacy issues that now require some culminating and resolution. The following will be a summary of those things for any interested party (NB: this is a fairly long post). With a very active Twitter profile, I found one of the most active (and divisive) conversations became one of my biggest commitments. As the discussion of local Public Transit issues ramped up, I jumped in with both feet. My empathetic approach to life dictated that I consider the issues from the inside, putting myself in the shoes of someone needing Transit and then advocating accordingly. As I delved into the thick of things online, I lost friends (or contacts I had considered “friends”), I studied city planning, and I asked tons of questions. Of course, as Murphy’s Law would have it, right around that time I was also dealing with some significant losses and financial troubles. So I faced the big decisions and considered my options (there weren’t many). I had to cut my costs significantly, meaning I was forced to take my car off the road and undertake a #TransitTrial in order to make ends meet. This was my chance to assess the system from the inside, and to put my advocacy voice to good use. Getting wind of my #TransitTrial, a friend recommended I try adding cycling into the mix to decrease wait-times and increase efficiency throughout my day. And so I did. During the summer months, the cycling was a welcome addition to the transportation options. It was a great work-out, gave me more flexibility in my day, and put me in touch with a new community of Londoners. 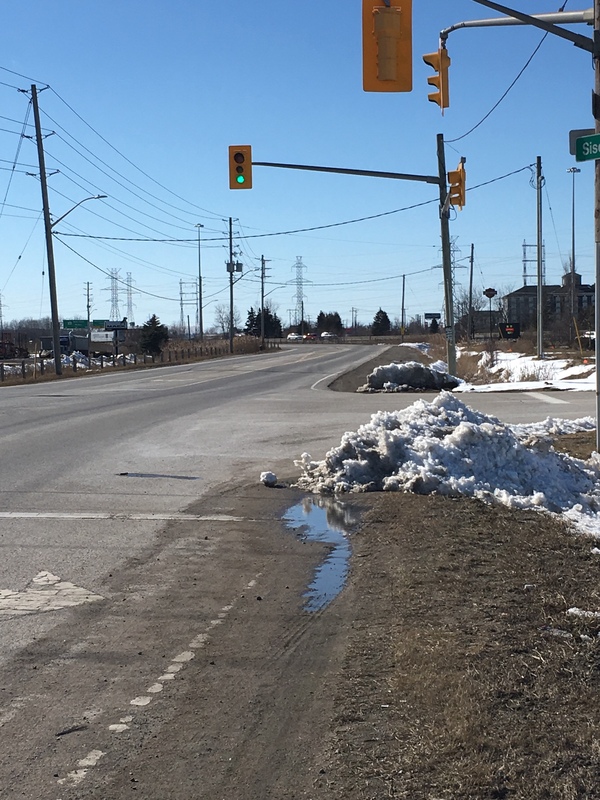 In the winter months, however, I was not as eager to commit to cycling but I continued my Transit advocacy and even recorded experiences of the #PedestrianLife around the city. I learned quickly that the accessibility of London is definitely lacking. Amidst (and probably due to) my experience of engagement in local issues, I heard from several friends and contacts who believed I may be a good fit for the “next level” of involvement – City Council. I knew right away that there was no way I could run for council in the immediate future (2018 fall election), but it got me thinking about the possibilities for the future. As is my way, I started researching the requirements and commitments that were involved with the position of City Councillor. I met with several men and women in the position currently and from the past; I surveyed friends and random local contacts in social media; and I spent a lot of time reading about and observing the activities of those involved in local representation. In the end, I was both surprised by the negativity of some but pleased by the positivity of others. The investigative process itself taught me a lot about the people and their methods in the local political scene. To those who were following this line of investigation, I am not discounting the possibility that I will one day be involved in a political campaign but I am not actively pursuing anything at this time. 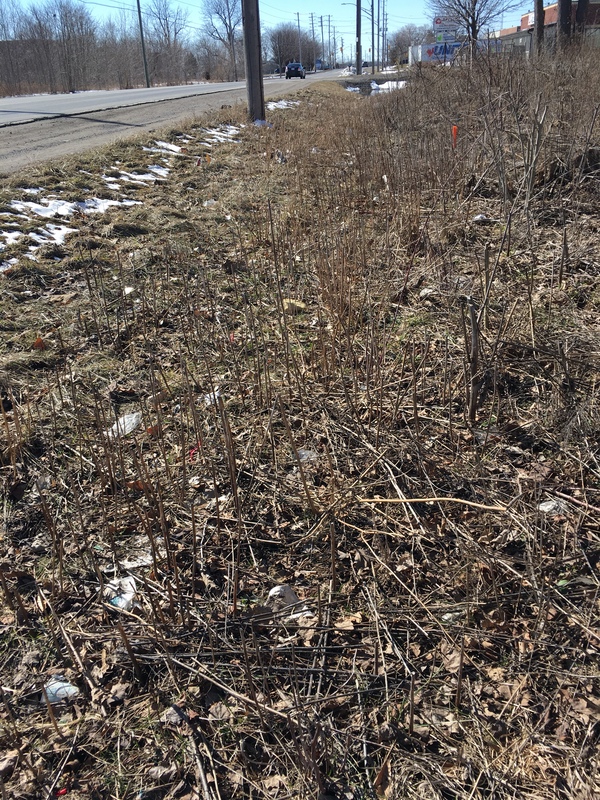 I am, however, still advocating where I can at a grassroots level for the overall improvement of the City and its functions. 4. Parkinson Society – While mentioning my updates for the public discussions, I thought I’d also post here the changes related to my quieter commitments. As many of you know, I have been a “helping hand” partner in the facilitating of the London Parkinson Support Group. With the head speaker-coordinator and organizer moving on, I have committed to increasing my involvement and starting in September I will be taking on her role. This has been another factor in my overall major shifting of “life-stuff”. 5. Brain Injury – And lastly, but definitely not of least significance, is the discussion around my brain injury (its effects and ongoing implications for life as I know it). As I age and consider my personal commitments to myself and future family, I have been making every effort recently to establish healthier routines, facilitate a life of optimal function, and giving myself the best chance at success despite my challenges. That is why as I fast-forward to April, 2018… I am in a much better place in life overall. I have reset my finances (sold my townhouse and purchased a “family home” with my life-partner) which means that now I can put my car back on the road because I can afford it. Which is good because the house I was able to afford is in St Thomas! So that means I’ll be driving back and forth to clients instead of taking bus. And there is definitely no chance of my running for City Council in London now. BUT…having said that, I am excited for the new possibilities in my new city. I’m looking forward to the free time for my brain and the increased attention and energy available for personal pursuits. And you can bet I will still be active on social media with local conversations and attending events in my favourite city whenever I can. As many of you know, I’ve been doing a #TransitTrial this past year – documenting my efforts to get around the city using Transit and walking and cycling. It also came right at a time when the Bus Rapid Transit “debate” was appearing in the news more because of the outcry at public meetings. I wanted to experience the system for myself to understand more clearly and to advocate more effectively. I’ve mostly been tweeting about my experiences, but I’ve also written a few blogs and have recently started a sort of “micro-vlog” of my travels as well (a vlog being a video-log of my experiences). I realized that there are many instances in which words are just not enough to depict just how significant a struggle can be. This past weekend, I had the opportunity to test out a different area of London than I usually tweet or share about. 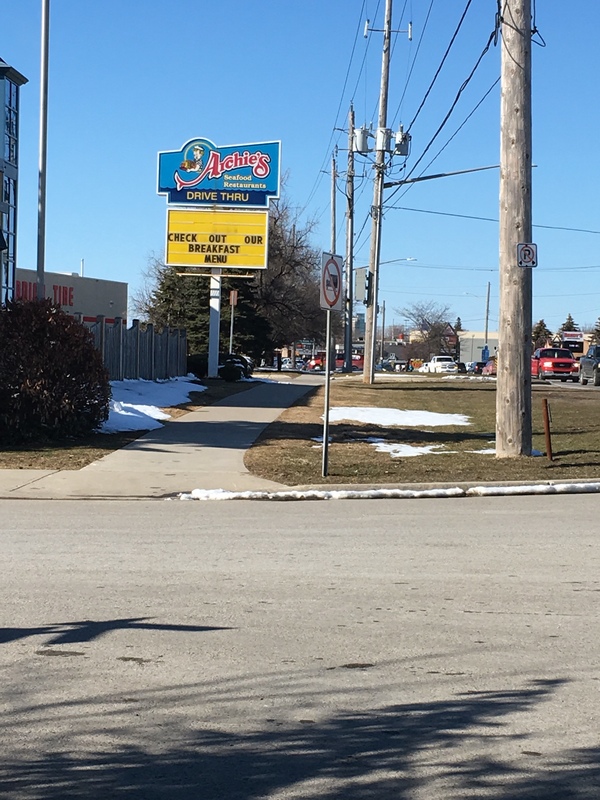 I made plans with a friend for brunch at Denny’s (at Flying J truck-stop), Highbury Ave south of the 401. James dropped me off on his way to St Thomas. Without any plans for the rest of the day, I decided I could find my way home (or at least to a bus route that would point me in the right direction). 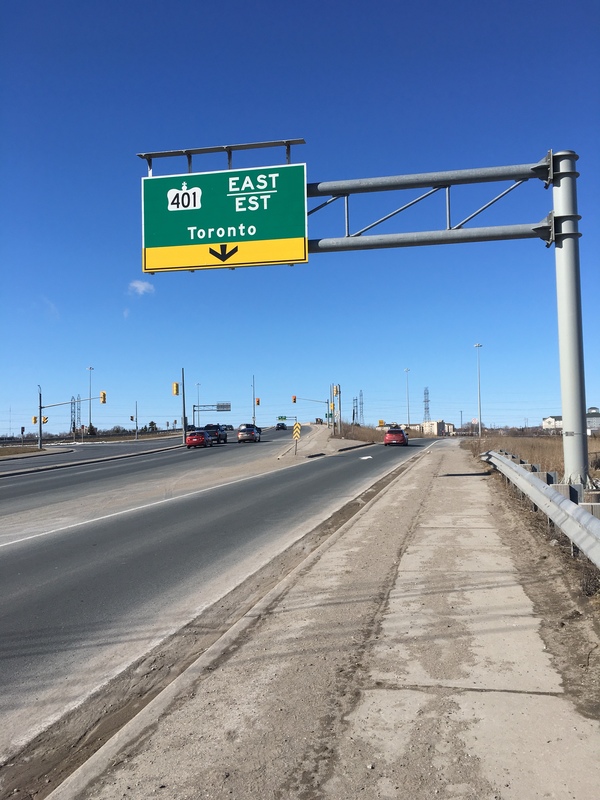 The south-side of the 401 is one of the least accessible areas in London. 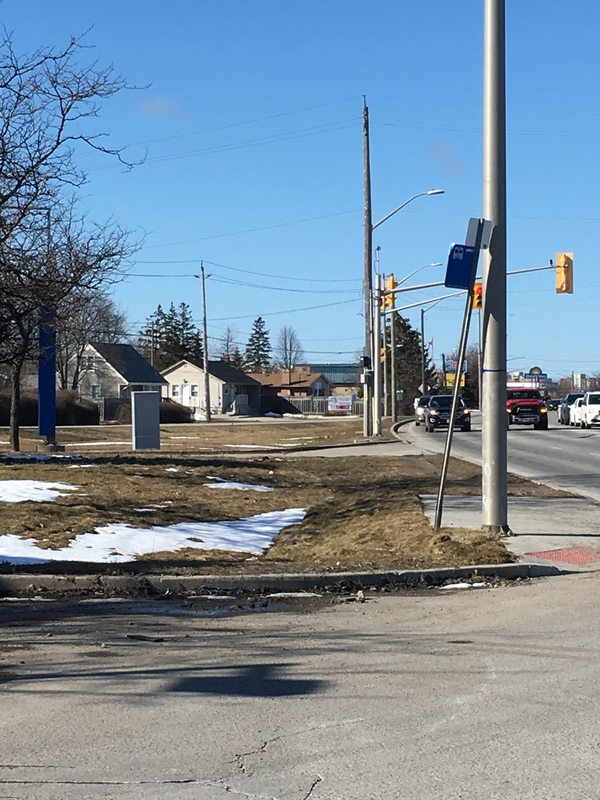 There are no sidewalks – barely a shoulder on the side of the road – yet they have crosswalks and a handful of bus stops with “accessible” little stand-alone concrete platforms. 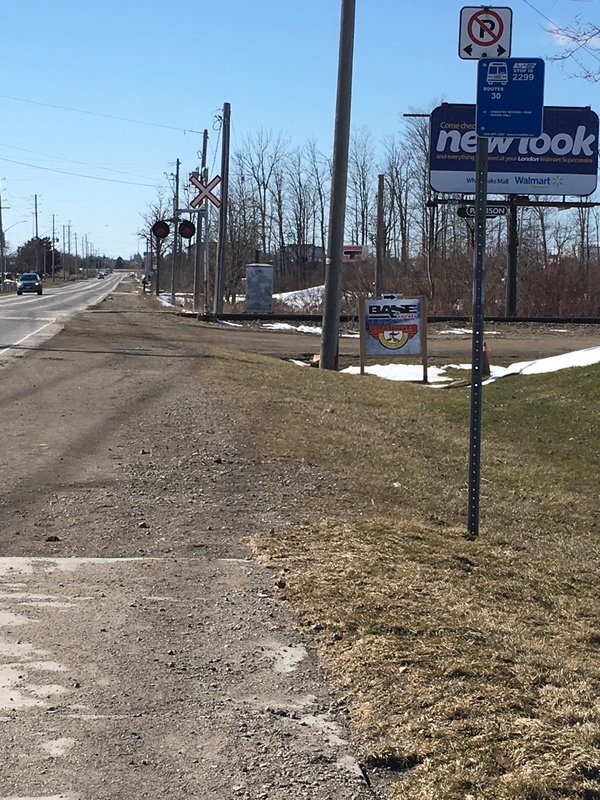 With the plethora of industrial businesses at that end of town, this is definitely an area in need of an upgrade when it comes to accessibility and transportation. 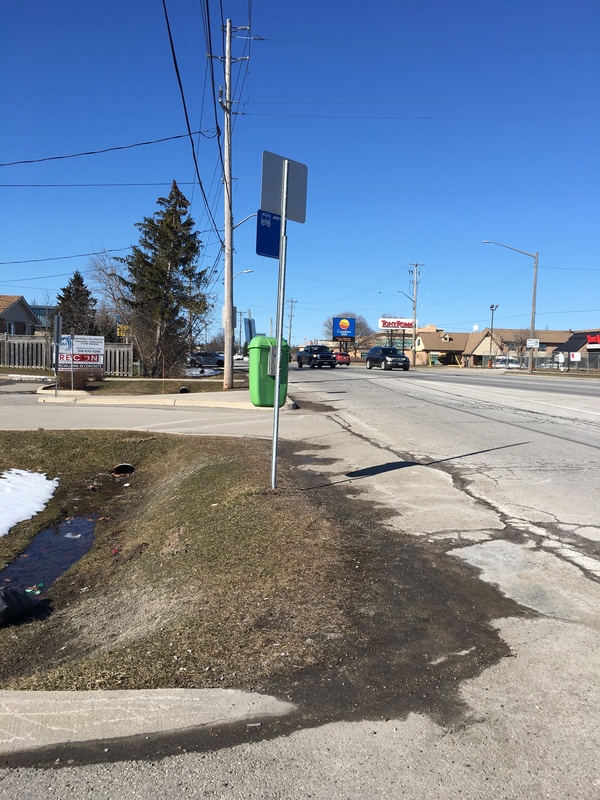 The following are a series of videos and photos on my trip from Highbury and Wilton Grove Rd to White Oaks Mall at Wellington and Bradley (where I knew I could grab a bus to take me home). Please also note, my route was self-guided as the option offered by Google Maps was not actually an option. 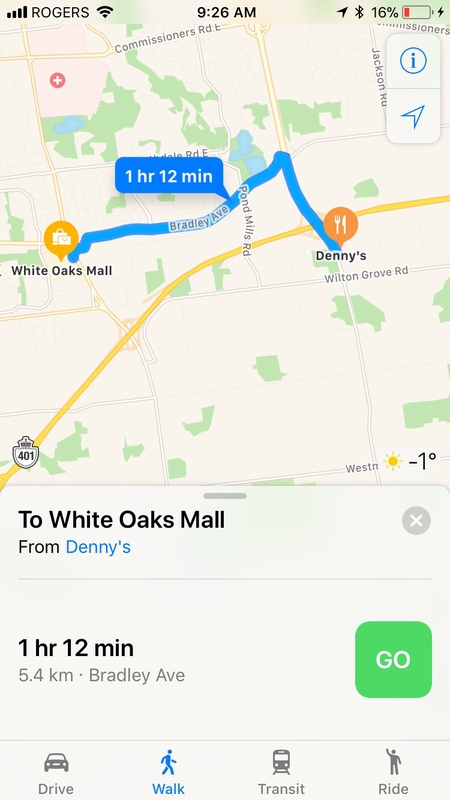 When I asked Google about the best route for walking from Denny’s to White Oaks, this is what it gave me. Thankfully I know the area well enough to know that this is not really an option. Highbury Ave in this area of London is a full-fledged, four-lane Highway. 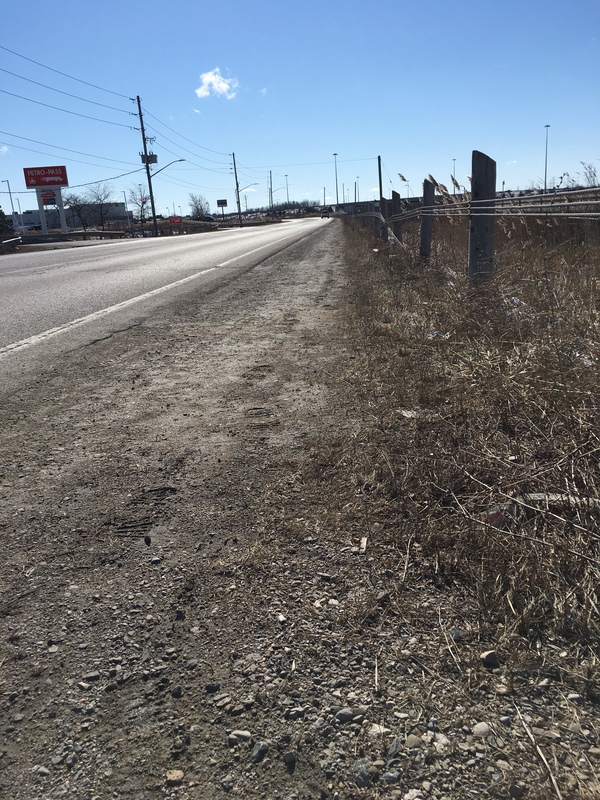 Between Denny’s and north of the 401 there are no sidewalks. 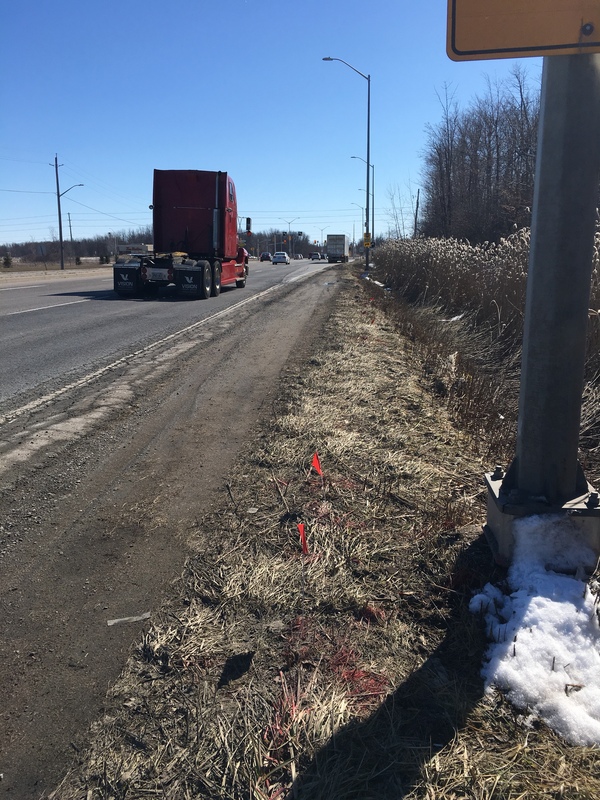 Then along Highbury there is only a gravel shoulder with a highway ramp leading up to Bradley – which is yet another busy road with no sidewalk until a person arrives west of Pond Mills Rd. 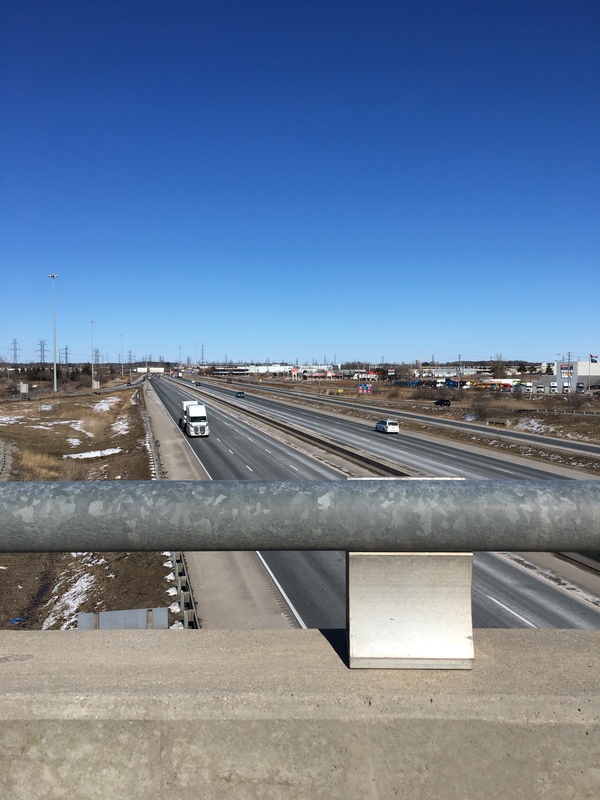 As I mentioned, I knew well enough that I’d have to travel along the south side of the 401 and come out at Wellington – where there is a sidewalk on the overpass over the 401 – and then travel north to White Oaks Mall. Of course, there were quite a few discoveries and challenges along the way (which I document for the purpose of moving us toward a safer city). 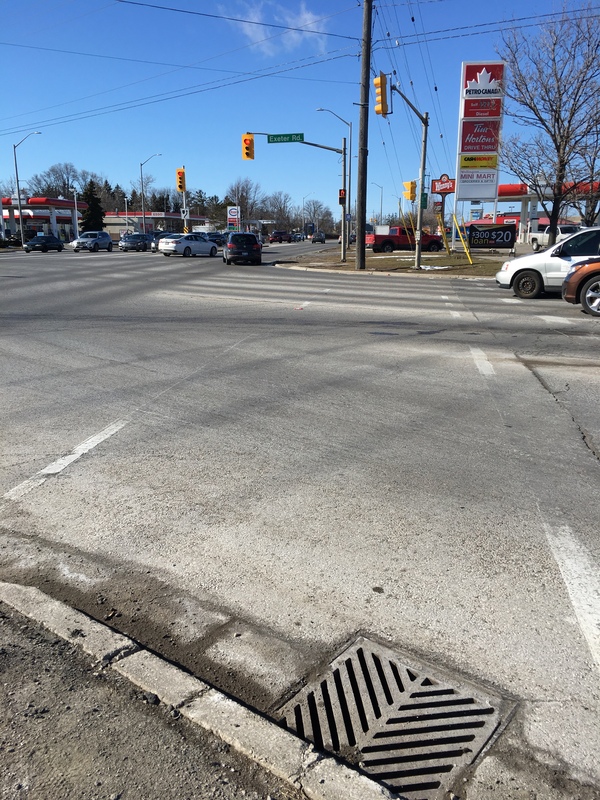 As there was a crosswalk on Highbury, between the 401 and Wilton Grove Rd, I was able to cross safely to the other side. 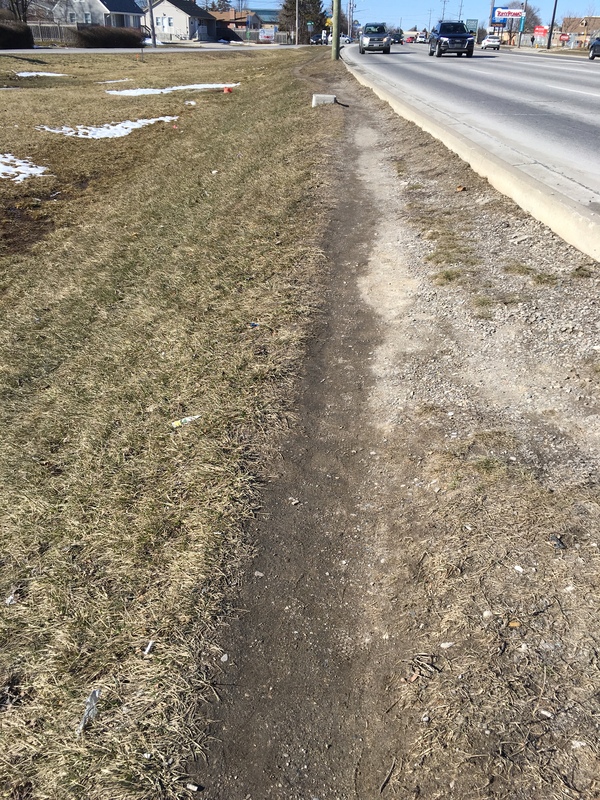 There were no sidewalks, but clearly there are enough pedestrians in the area to have created a well-worn foot path. I found this to be a common occurrence in my travels. 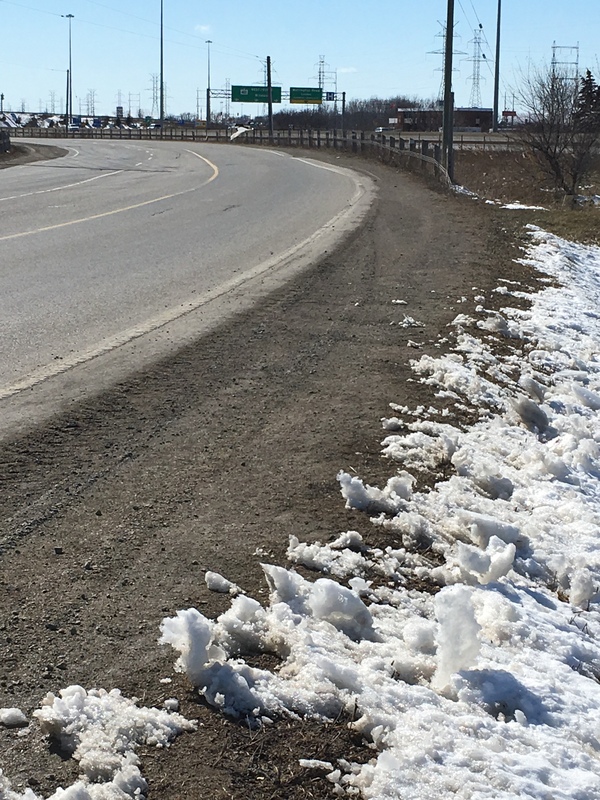 At the point of the above picture, I made sure to check for traffic behind me and, when it was clear, I walked on the road. Still no sidewalk, but now I’ve discovered a bus route. The road was quite busy for a Saturday – I was surprised. But, of course, I realized there are factories along here who have weekend operations (so that made sense). For those who don’t have a car, though, they are S.O.L. This bus route only runs on week days, and even then only during peak hours. Check out that full parking lot of cars at Nestle! 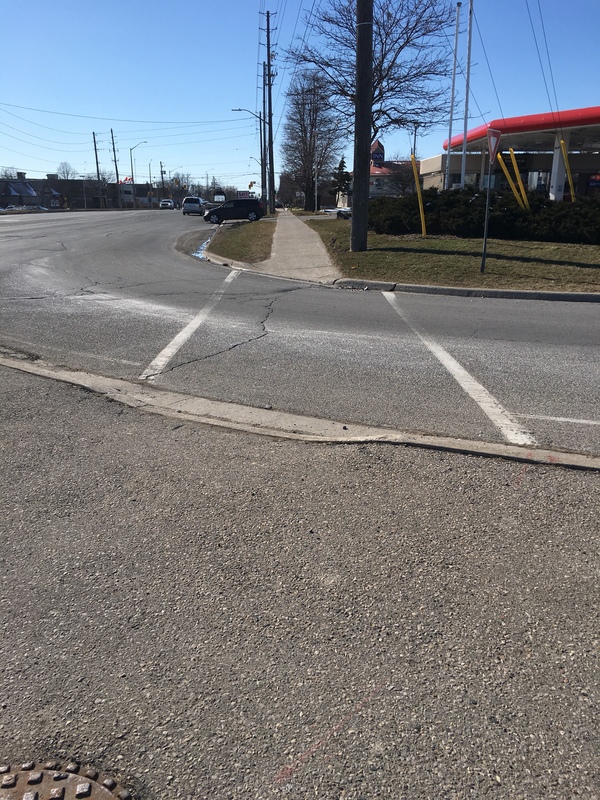 This was an interesting discovery – a crosswalk with no walk indicator. The button is there, but for what purpose? 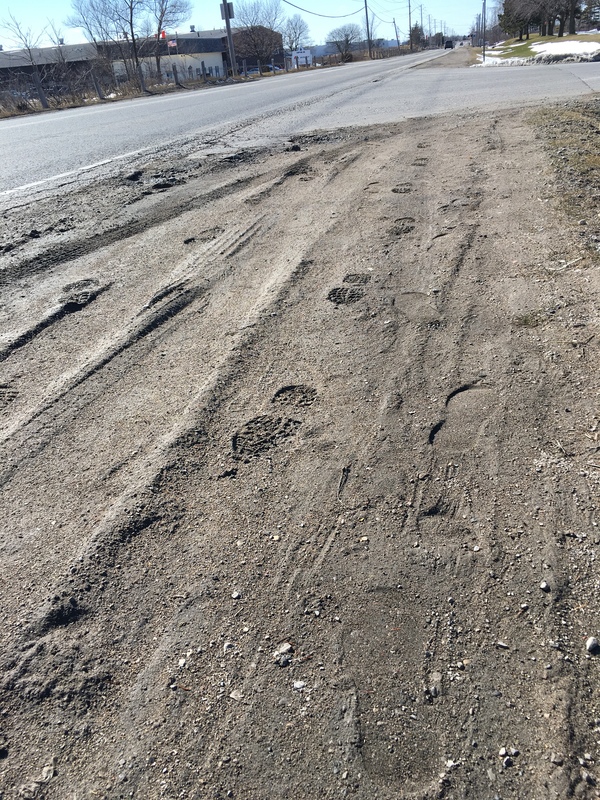 Again, I kept coming upon foot prints in the dirt so I am not the only one trekking this area by foot. Sad that safe infrastructure is not a priority in this city. I took this photo for perspective. That’s my foot in the bottom left. I’m sitting on the barrier as far away from the road as I can get, but I’m still that close to any passing car. This was one of the scarier moments. Although I was safe, I still felt very exposed. I made it to Wellington!! I was not the only pedestrian out walking on this blustery day. The view from the top was a bit terrifying. I’m afraid of heights and, with the wind as strong as it was, walking over the overpass was like walking across the suspension bridge in Lynn Canyon near Vancouver, BC. 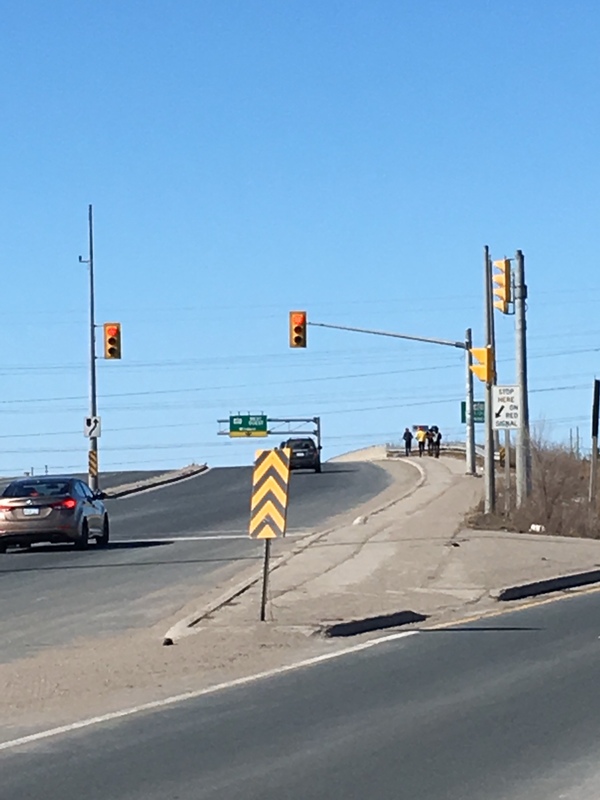 Once so got over the bridge and safely to the next cross walk, I found the sidewalk just stopped for half a block at Wellington and Exeter Rd. Clearly there are many pedestrians in this area, as demonstrated by the well-worn foot path, but for some reason the city doesn’t have a sidewalk for about 20+ meters on both sides of Wellington. 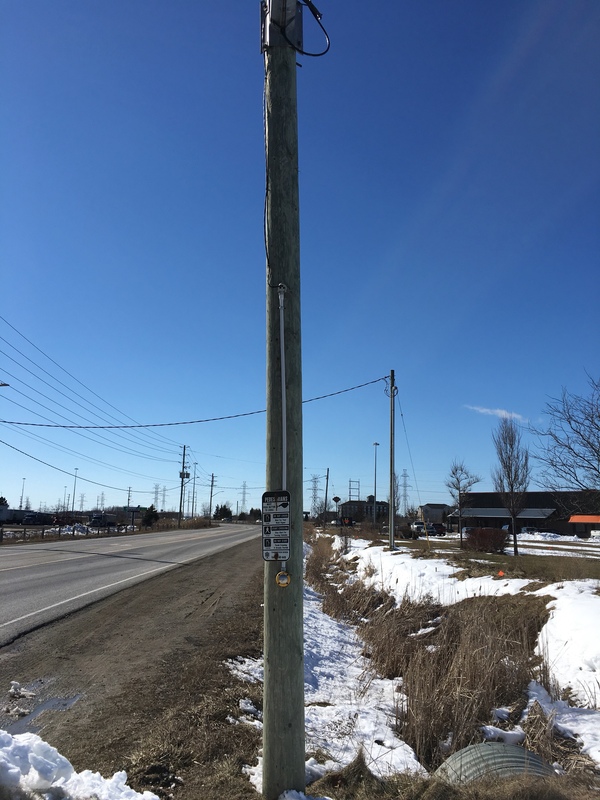 The above photo is facing west on Exeter Rd. 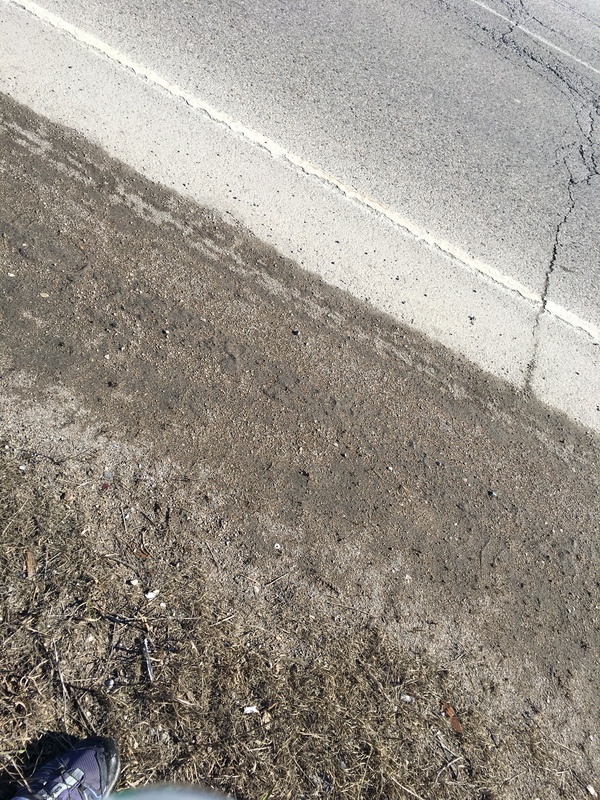 Sidewalk is on north side of Exeter. Standing in the same spot as last picture, but this time facing north. 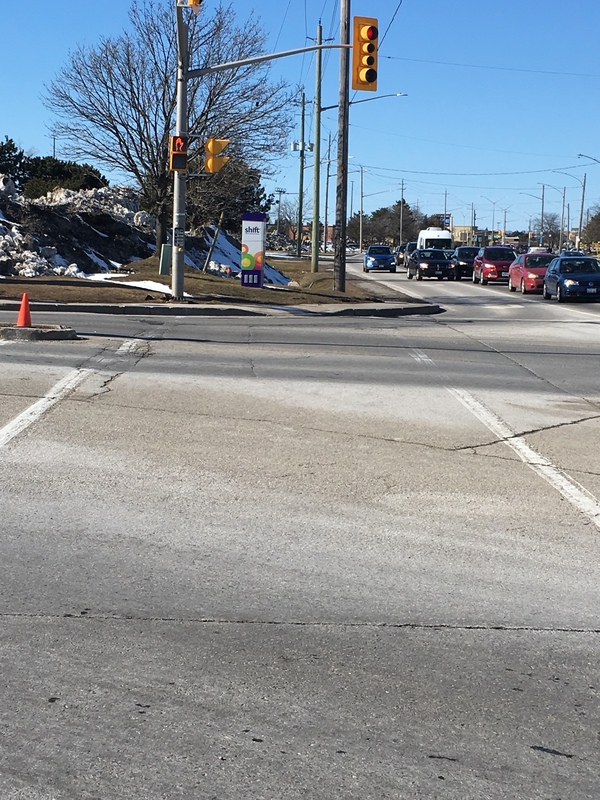 No sidewalk on the west side of Wellington (at one of the busiest intersections in the city). 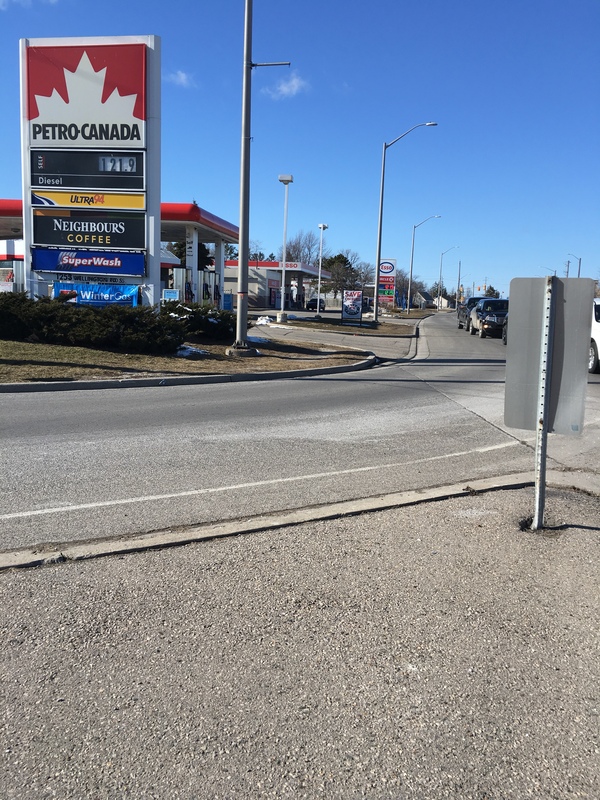 Once I passed the Petro gas station, I looked over to the east side of Wellington, where – low-and-behold – a sidewalk begins! My first thought was that maybe it’s because there is a bus stop there. 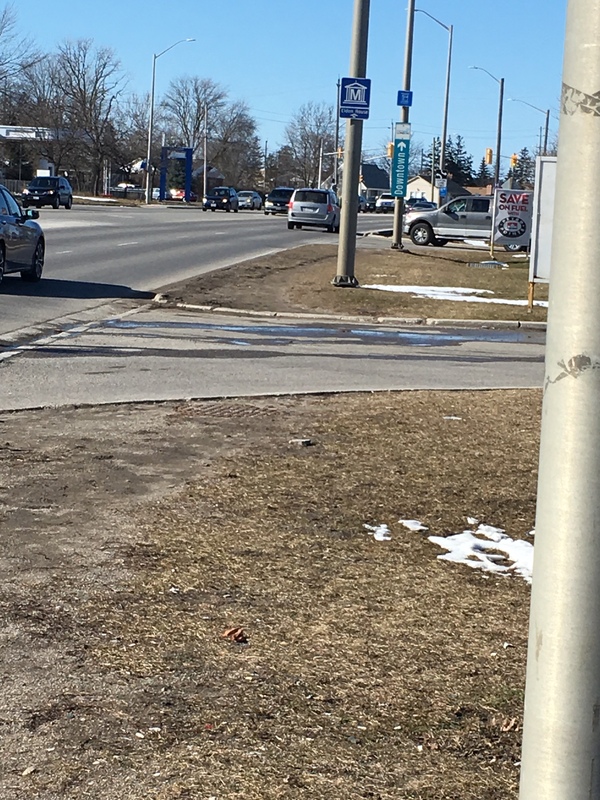 But, no, then I realized that there was a bus stop right in front of me, but still no sidewalk. ? Oh look!! ? 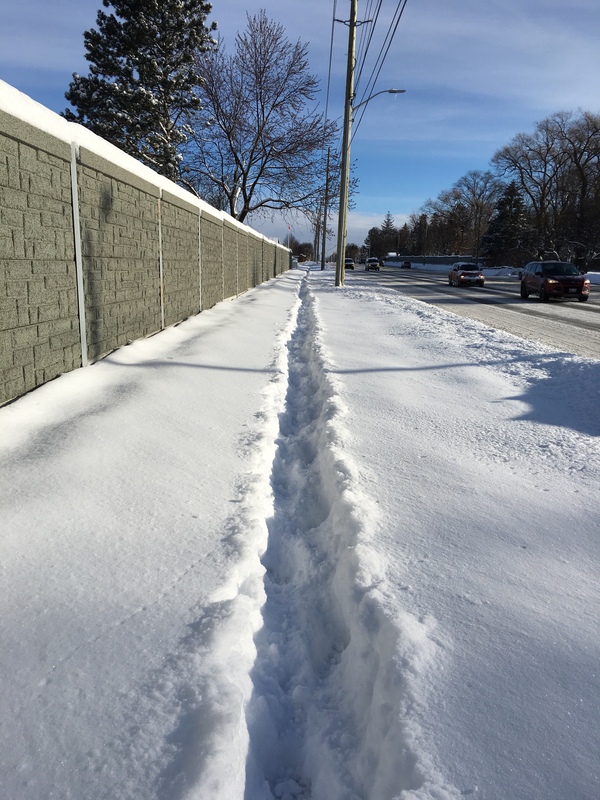 A sidewalk! Well, London, this has been quite the learning experience. Thanks for the exercise and enlightenment. Hopefully we can use this info to better the accessibility of our city going forward. 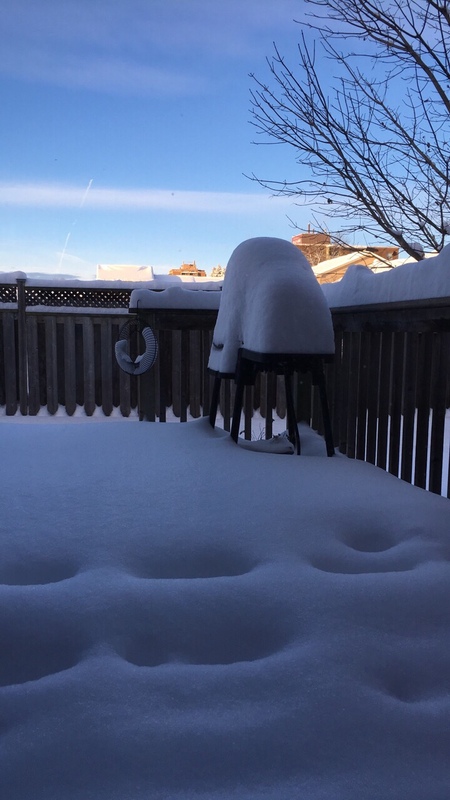 Today was a good day to be staying at home if you had the option. Unfortunately, dementia doesn’t take a day off, so I was off to work! I do have to say, though, I enjoy the winter and the cozy-ness of the snow. I suppose I’m kind of crazy that way. I’ve been taking a few snapshots while out and about in the snow. I have to remember not to get my phone out too much though because the battery on my iPhone does not like the cold. 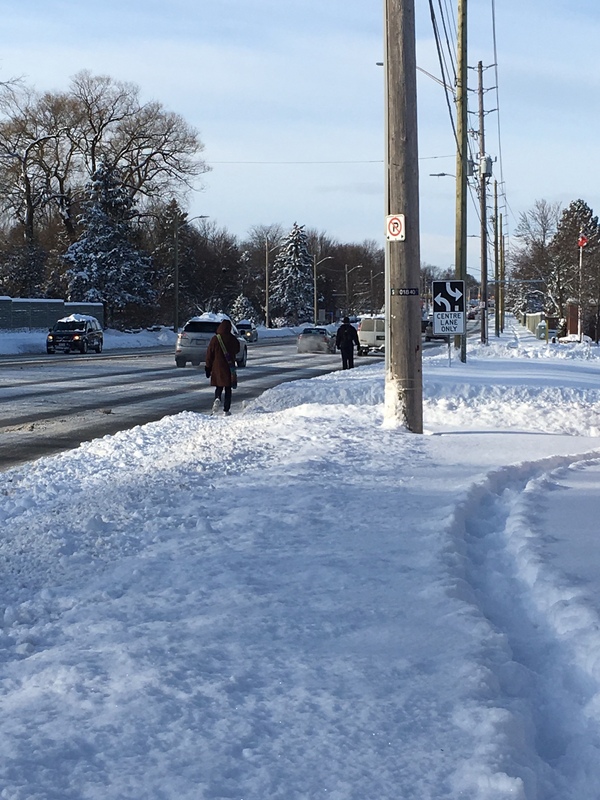 I’ve mostly tweeted about random happenings, sidewalks shoveled in remote “Old Oakridge” (where we only JUST got curbs and gutters this year), and sidewalks NOT shoveled along the busy 4-lane Fanshawe Park Rd. 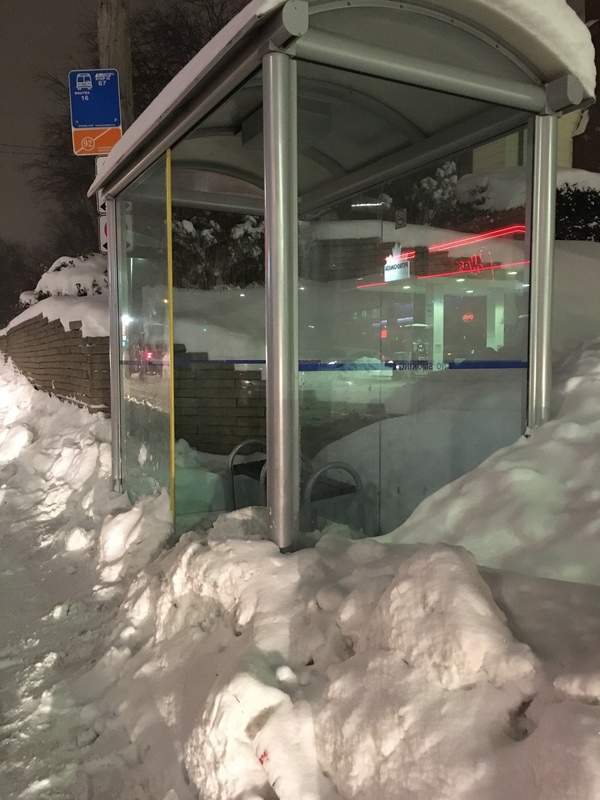 And then there’s the bus shelter igloo I built today…I forgot to snap a shot of that one, but it was a fun topic of conversation! ? What I’ve learned in my years of working with a CBT therapist is that we can change our experience of reality by changing our expectations. 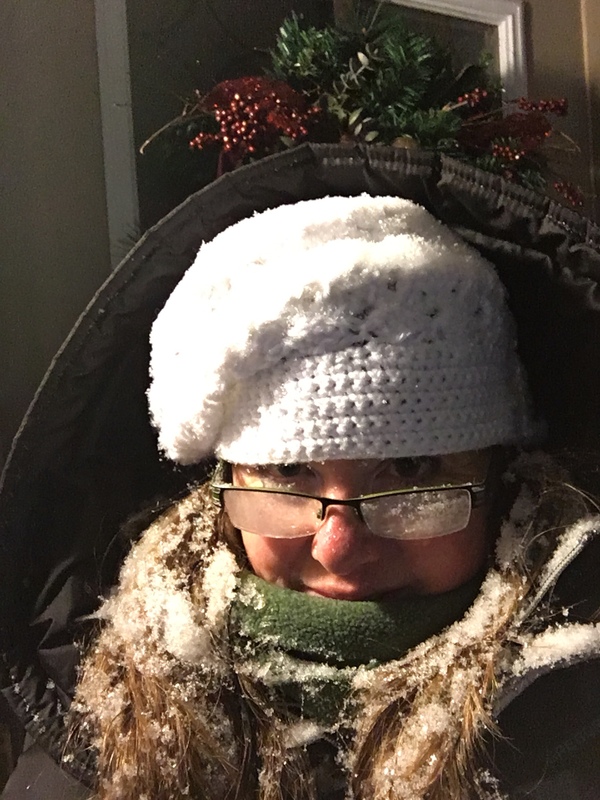 So this week as I knew the snow would be arriving, I’ve been adjusting my expectations of my travel time, and low-and-behold I have found myself pleasantly surprised by my joyful attitude! 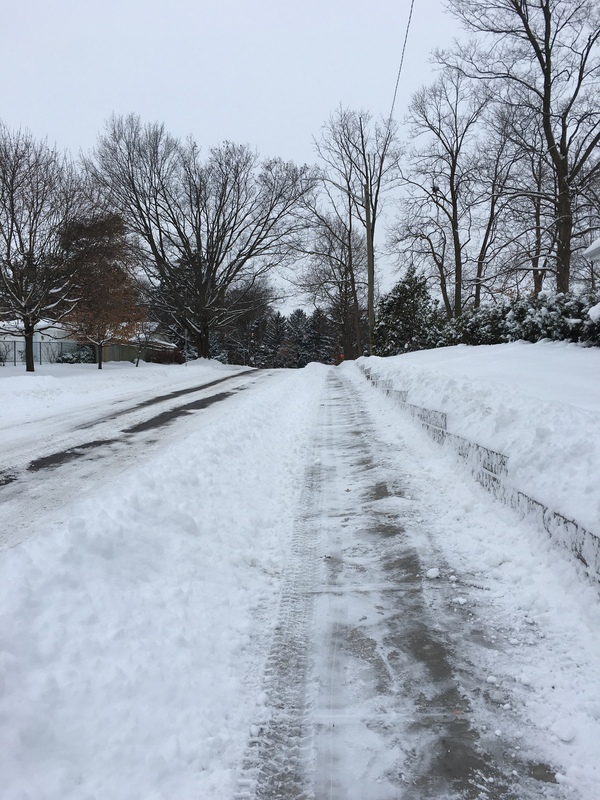 Life is much for enjoyable when we can see the goodness in people around us, when we notice the beauty of a single snowflake, move to the danceable tunes on the iPod, and partake in some childlike fun building snow forts. So here’s to all my fellow pedestrians and transit riders out there tonight! I wish you safe travels wherever you roam. And to the City workers clearing snow, and the bus drivers getting us around town safely, I salute you! ? Good evening, friends. If you see this post on FB and comment or interact on FB I likely won’t see it for a while. Please send me a private message or comment on my blog if you want to interact with me directly. I took the Facebook app off my phone. I love Facebook for how it brings people together and helps us share uplifting or cautionary messages with those who might not otherwise be in touch. I love that we can share photos of our experiences and celebrate one another’s accomplishments. I love that I’ve gotten to know some of my extended family and classroom acquaintances (or even teachers!) more, because we’ve stayed in touch here. It even helps me plan Free Hugs Days or birthday parties, or going away parties! There are so many positives. However, as most people know, Facebook also has a darker side. It can be a real distraction for those of us who struggle with distraction. It can also be a very dangerous tool of comparison – even for those who wouldn’t necessarily say they struggle with mental health concerns. In a capitalistic (or any type of) society, being on the “right” side of the proverbial fence tends to be a destructive experience. Sociologists and psychologists alike understand that being so connected has become a great thing for the spread of knowledge and news but also a hindrance because of the spread of misinformation and pseudo-facts or comparison. The price of connection has definitely taken its toll. I understand the frustration completely. Though “Freedom of Speech” is a good thing in many ways, its dark side can be more than just disheartening, words can be very damaging. So…the moral of the story is…if you’ve read this far, I am super excited that you care enough to look into how I’m doing. Please stay in touch by commenting here on my blog or send me an email or text or Facebook private message (if you have that info). You know me, I love connecting with people in a genuine way. So I was up till 1am last night having a panic attack about getting documentation ready for my ODSP application, then talking through issues that ensued with my boyfriend. I was awake at 7am this morning to get on the bus by 8:40am to arrive at Staples by 9am to photocopy the application and send by ExpressPost. What a nightmare this ODSP process has been. From rude, argumentative workers, to ignorant and rude GP who refused to read the specialist documentation I provided then wouldn’t fill out the form properly, to mail complications and ODSP customer service people who talk a mile a minute when I call in for help. *sigh* I’m exhausted just sitting here thinking about it. I have so much documentation to prove my disability (to send with my ODSP application) that it doesn’t all fit in the regular envelope they give me in the application package. I’m glad I thought to grab a used envelope I had held onto that is larger. I taped the smaller envelope that the ODSP office provides to the front of the bigger envelope and then put it inside the ExpressPost. Then I had to call the ODSP 1-800 number twice to ask for clarification of the address because the postal lady said the postal code is wrong. Yet the ladies at ODSP insist it’s the right postal code. So I went ahead and filled out the ExressPost and asked for a signature. 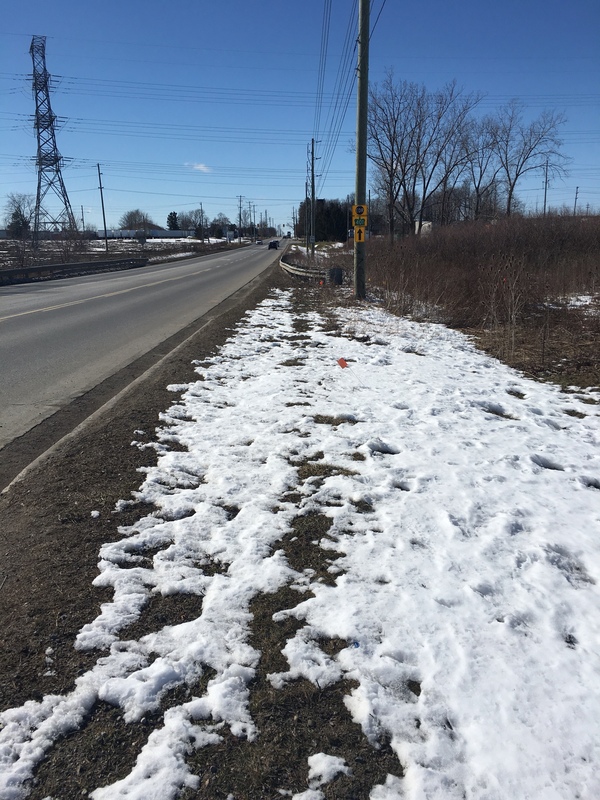 Of course the address ODSP gives me is a box# and I can’t get a signature from a box# – turned out I needed a completely different address! Good thing I left myself an hour to do stuff at Staples because that’s how long it took me (to photocopy the application for myself and get the ExpressPost sorted out). Now I’m waiting for my first appointment of the day and I just want to bawl my eyes out because my brain is so stressed and exhausted. Thank God for coffee! Some days I sit here and think to myself…Life is cruel. NB: For those reading this through Facebook, please don’t comment on the Facebook post. If you’d like to reach out, please comment here or in private message. Thank you. Mondays I have two clients that I visit (for those who don’t know, I’m a professional “companion” for seniors and those needing a helping hand). Luckily, the first is walking distance up the street from where I live (albeit a 45min walk). After a good hour this morning of checking my schedule, the bus routes, and discussing the events of the day with my boyfriend, I opted for getting a ride to my first client. 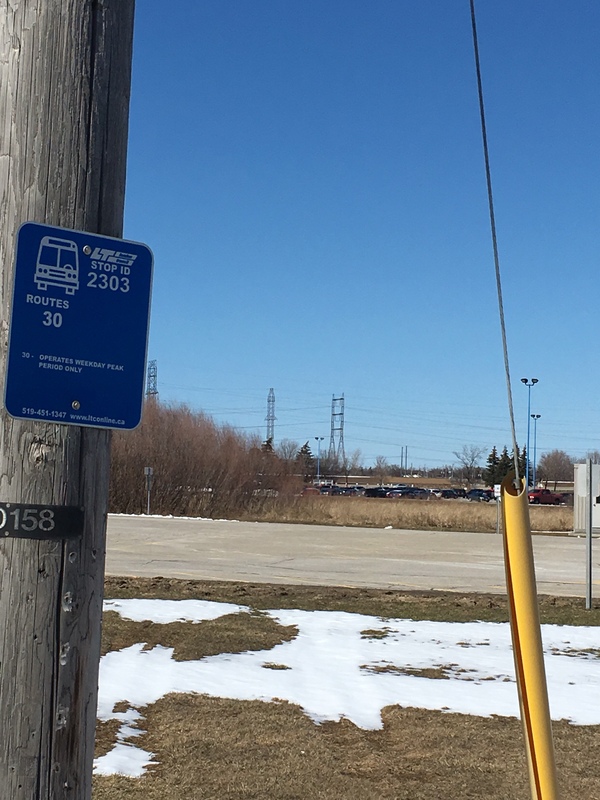 Now, here I wait for bus 25 back home to grab a quick bite to eat and throw supper in the crock pot; then a quick walk to Adelaide to catch the Express Bus to Oxford, then another bus up to Wonderland, then a 20-30min walk into Old Oakridge. The only thing faster than this route would be to incorporate the bike (and ride from Express route to community) but my body is in a lot of pain lately which makes lifting the bike on and off the front of the bus next to impossible. So, altogether, I should technically be able to get from Stoney Creek community to Oakridge in about an hour and a half from start to finish. With a bike, that trip could be shortened to 55mins. I grabbed a salad at Subway to eat on my quick 30min stopover at home. I will barely have time to eat and throw meat in the slow cooker and then I’ll be off again. If you’ve been following along on my journey recently, you’ll know that I’ve decided to give up my car for a year to save some money. This week is my final week of using my vehicle and I think I will have used my car more in the past week than I have the past three months! This morning I had to make a quick run back to a store I had been at on Saturday, where I had accidentally left part of my purchase. Luckily, the ladies set it aside for me and it was waiting for me at 9am just as soon as they opened today. Had I not have had my car, I would have had to leave at 8am instead of 8:30am. 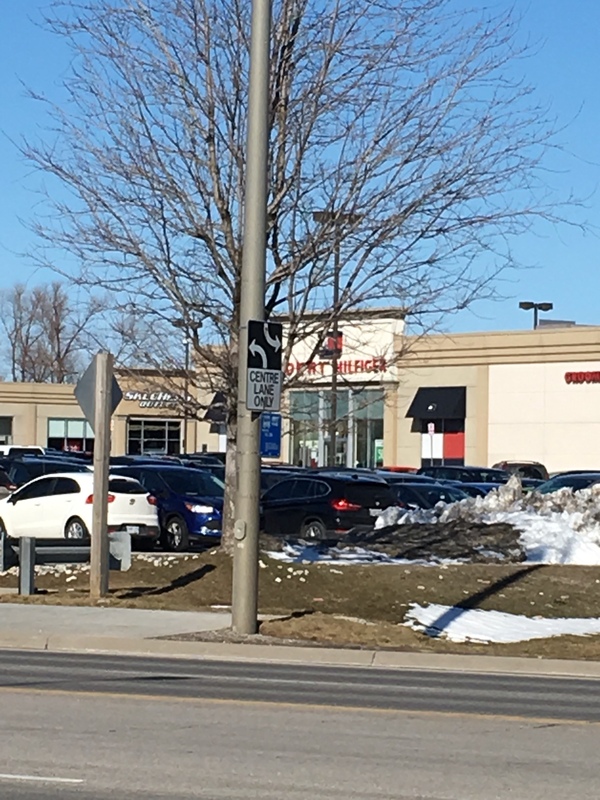 Yes, the store was still on my way to see my client (by bus OR by car), but that 30mins extra in the morning can mean the difference between eating and not eating, or rushing and preparing for my day in a mindful way. Also, having my car will mean a significantly shorter travel time between clients which will end in a “shorter” day overall so that I can have supper before I go off to my evening elective. This is exciting! While I practice mindfulness tricks throughout the day using transit (to keep me calm and to deal with the many mishaps along the way), I find that I am more mindful when I am allowed extra time in my day. I HATE rushing and do everything in my power to avoid it where possible. But whether I’m finding more time for mindfulness on the bus, or finding more opportunity for mindfulness in my quiet home/car, I guess the main point is that I’m consciously being more mindful through this entire exercise. So that’s kinda neat. As I think about how handy it’s been to have the car this past week, I also recognize that I’ve been able to do some shopping without that extra physical stress and exertion, and I’ve had less backpacking pains from carrying my life around on my person throughout the day. It’s been kind of wonderful, actually. I really am going to miss this freedom and ease over the next year. So…the decision has been made. After a summer of the #transittrial #multimodaltrial, then realizing that selling my car was not really something I wanted to do or COULD do easily, I’ve made the decision to simply postpone my use of it for one year. That will give me some time to catch up on my debts that are piling up, and will make life a bit more manageable financially. If all goes well, I will be able to pay down one line of credit almost entirely. What began as an idea to save “some” money has now become a very necessary exercise in saving a BUNCH of money. It just feels right. I hate carrying around the debt that I do, and it will help me to continue advocating for better public transit as well as the local cycling community. I also have a second personal goal of becoming healthier and dropping some weight, so I’m sure these two things will go hand-in-hand. As I sit here preparing myself physically, emotionally, and mentally to face the day (and my week), I wanted to compile my thoughts and make this official announcement to my followers. So, starting next week when my insurance renews, I will officially be without my vehicle. I will be using my bike as much as I can until the snow flies, and once that happens I will get a really clear picture of the transit experience. 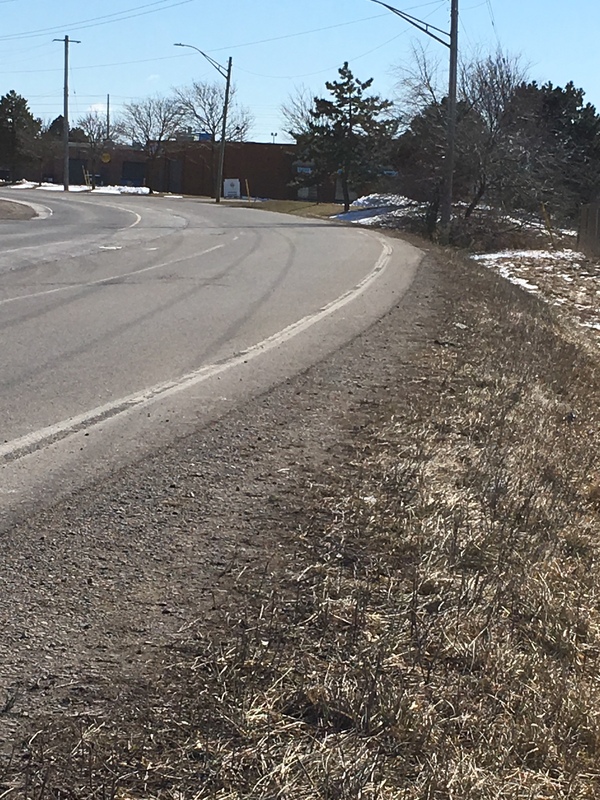 I plan to continue posting thoughts and reflections on my car-free lifestyle – good and bad – and we’ll see how it goes. Stay tuned for more!